Backstage Science are going behind several of the more prominent of England’s research facilities, giving an informal glimpse of what’s going on in there. It’s a nice concept, to try show what’s inside some of the larger facilities that most people would never get to see. In the second video they have produced in the series thus far they visit The Diamond Light Source, the UK’s national synchrotron facility. Simplistically put, synchrotrons accelerate particles to very high speeds to create very powerful beams at a chosen wavelength of ‘light’. One use of synchrotrons are to work out the structure of a protein, but for now it’s enough to look at the machine itself. They’re pretty impressive! The second video gives a (very) simple explanation of how synchrotrons work and what they’re used for. 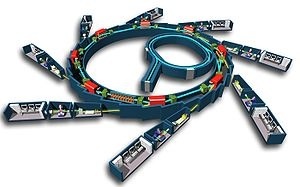 The synchrotron in that video is in the USA, the Brookhaven synchrotron at Long Island. Enjoy the videos. Weekends are good for that!